Arlyn Scales is a prominent scale manufacturer in the New York area that has been designing and developing some of the most technologically advanced scales on the market for the last 30 years. As an actual manufacturer as opposed to merely a dealer, we are able to ship our products directly from the factory which eliminates any middle man markup which in turn saves the customer significant money. At Arlyn Scales, we design and manufacturer our own load cells, computer software and microprocessor instrumentation, which sets us apart from most of our competitors. Because we design and build our own products and their subassemblies in our own factory, we are able to produce our scales quickly and efficiently without sacrificing quality. 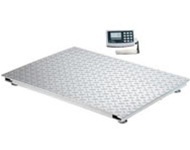 One of our flagship platform scales is our Arlyn Series 3200 Floor Scale. These scales are manufactured in both aluminum and stainless steel and each are extremely durable for a variety of different needs. With a wide variety of options, a platform scale may be the perfect match for your weighing needs. There are a many reasons that set the Arlyn Series 3200 Floor Scales apart from the competition which are listed below. Arlyn Scales load cells are far superior to other scale manufacturers. We manufacture all of our load cells from stainless steel, which offers extreme durability and longevity compared to standard aluminum load cells. In the production of platform scales, Arlyn Scales uses four load cells, each positioned in one corner of the scale platform. This gives the platform a lower profile and shorter on/off ramps (should you choose to include them), prevents load shifting and related injuries, and better protects the load cells from shock and overloading. A summation board is used by many scale manufacturers to correct sensitivity problems that arise when using multiple load cells. Summation boards require that a person use a screwdriver to make minor adjustments until all of the four load cells output an identical reading. This process can be tedious and is not always accurate. Arlyn Scales, on the other hand, corrects this issue much differently. Because we manufacture our own load cells, we are able to measure and match output signals across load cells at our manufacturing facilities in Long Island, New York. We create load cells in large batches and measure the outputs of each. We then place the load cells in groups of four based on the similarities of their outputs. Therefore, the adjustment step is being done prior to the load cells being attached to the scale, which eliminates the need for a summation board. Eliminating a summation board is vitally important, as this is one of the largest causes of scale failure in the industry. By using summation boards, scale manufacturers open themselves up to all sorts of mechanical failures due to the connectors and knobs required with this type of equipment. Arlyn Scales 3200 Floor Scales do not require summation boards and therefore are much more reliable and tend to last much longer than other scales. The Arlyn Series 3200 Floor Scales offer a weight capacity of up to 1,000 pounds and platform sizes of up to 48 x 48. Depending on your use you should be able to find a platform scale that will work for your needs. If you are looking for a smaller capacity, but higher resolution you would likely choose our 320D model because it has a capacity of 500 pounds and a resolution of 0.1 pounds. This model has a finer resolution than the 320M model which has a capacity of 1,000 pounds but a resolution of 0.2 pounds. Whether you need a finer resolution or a higher capacity, our platform scales will meet your needs. We can also custom build a scale that meets your size and capacity requirements. If you require a higher resolution and capacity, we’re always available to discuss your options with you and guide you to the scale that best meets your needs. The term, “big data” is a phrase used all the time in a variety of industries. Big data refers to the collection of large amounts of data from a variety of sources and devices. With Arlyn Scales, you are able to collect data from your scales using the connectivity method of your choice. This makes the cataloging and storing of data much easier than you may realize. Think about being able to quickly analyze data being generated from your scales in real time to determine how to adapt to various scenarios. Using one of the connectivity options provided by Arlyn Scales can yield large dividends for your industrial measuring needs. Ethernet Ð Our scales can be equipped with an Ethernet connection that allows you to plug our scales directly into your Local Area Network. If you utilize wireless networks at your place of business, you can use our proprietary Remote Indicator Software where weights can be recorded and analyzed from a PC. Ethernet gives you the ability to monitor your scale outputs from anywhere in the entire world via the internet. USB (Universal Serial Bus) Ð USB is our most popular connectivity option and allows you to plug a PC directly into one of our scales. This allows you to monitor and control your scale via our USB Remote Software. Weight data can be sent to either an Access database or an Excel CSV file to be analyzed by your team. If you would like to access the weight data from another application, Arlyn Scales has a utility which can export the data to any Windows application. Datalogging Ð Datalogging allows users to access weight data without a PC. Our scales allow you to plugin a USB flash drive into the scale to store the weight data. This weight data can then be loaded into Excel via a CSV file or to other database applications such as Access. This is a great option for those who are not able to connect a computer directly to a scale but still need to access weight data. Set Point Ð The set point option is one of the features that sets Arlyn Scales apart from the rest of the scale industry. This option can allow the user to enter multiple weight values into a scale that can then trigger filling, batching, and other basic functions. When the scale reaches one of these designated values, it can send out an electrical signal that will prompt another piece of equipment to turn on or turn off. Through this technology you can help to automate some of the basic functions used to load and unload platform scales in your business. Arlyn Scales offers a wide variety of platform scales, which are manufactured to the highest standards on the market today. For any questions about our entire line of scales, give us a call on our toll free line at (800) 645-4301. You can also contact us using the online form on our Contact Us page .